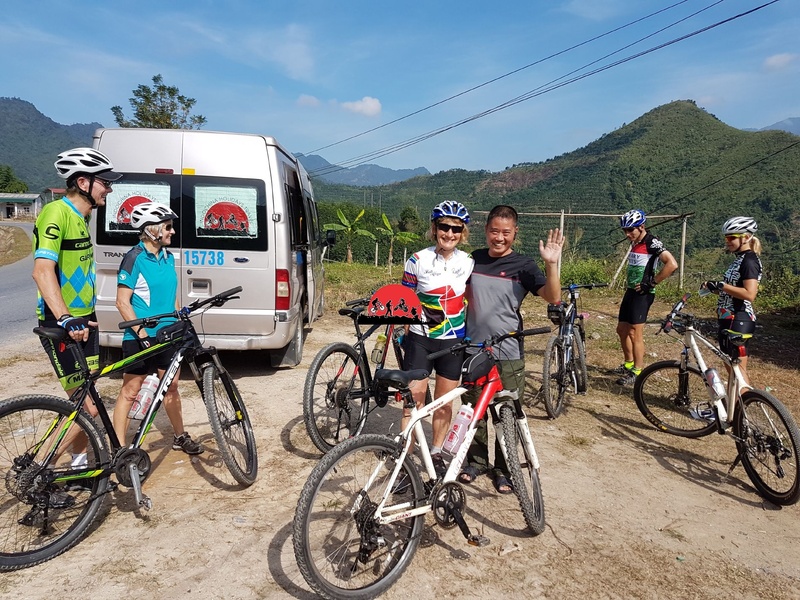 Saigon Cycling To Luang Prabang – 24 DaysThis cycle tour through the most of Vietnam spectacular beach ,mountain range is for cyclists seeking a biking challenge, enjoy climbing and mixing it up with some off road trails. 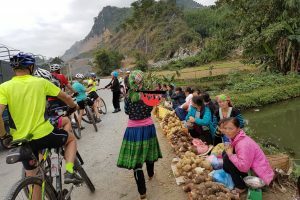 This tour goes to a part of Vietnam where few foreigners ever venture and you’ll be amazed at the colourful clothing of the many ethnic tribes as you ride through valleys and river gorges to Dien Bien Phu. Here we’ll visit battlefields and learn how Ho Chi Minh defeated the colonial French and then two long days of riding will be rewarded by a stay at the charming Dien Bien Phu before heading to Luang Prabang . 7:30 Am pick up at your hotel in Saigon .Enjoy 2 hours driving to Dong Nai province. Ride through coffee plantation, pepper on hilly country roads in surounding area of Nam Cat Tien park. Have in Madagui and have another stop at Bao Loc, the homeland of coffee and green tea. Enjoy delicious speciality snack, coffee and tea. Then have a transfer to Dalat. Start to ride from your hotel in Dalat. Ride through majestic mountains and valleys. Have a picnic lunch in Khank Vinh town. In the afternoon, we ride on backroads through villages to Dien Khanh where we get on a van/bus for a short trip to Nha Trang. Overnight in Nha Trang. Visit the Po Nagar Cham tower in city of Nha Trang and have a transfer out of Nha Trang city, pedal on quiet country roads through rice paddies and beautiful village coastal roads. Enjoy lunch on the beach,then continue pedaling on back roads through fishing farms and villages to Tuy Hoa. Transfer 2 hours to Qui Nhon city. Transfer 30 minutes of out busy city of Qui Nhon. Begin with cycling through rice-paddy to mountain areas. Cycle past many little villages to ocean roads. Today you will have the opportunity to admire beautiful coastal roads. In the afternoon, cycle uphill through mountains, rice fields and coconut plantations. Transfer by bus/van in the late afternoon to Quang Ngai. Have breakfast at the hotel start to ride to My Lai village from the hotel. Have a short visit and talk to locals about the massacre of more than 504 locals in 1968. Continue riding 35 km on hilly roads before having lunch in town. After lunch, ride on back roads, passing by white sand dunes. Cycle on broken track trails along the ocean to fish farms. Then continue biking to Hoi An. Overnight in Hoi An. Van/bus takes you out Hoi An, have a little time to warm up your body before pedaling uphill to the peak of Hai Van pass. 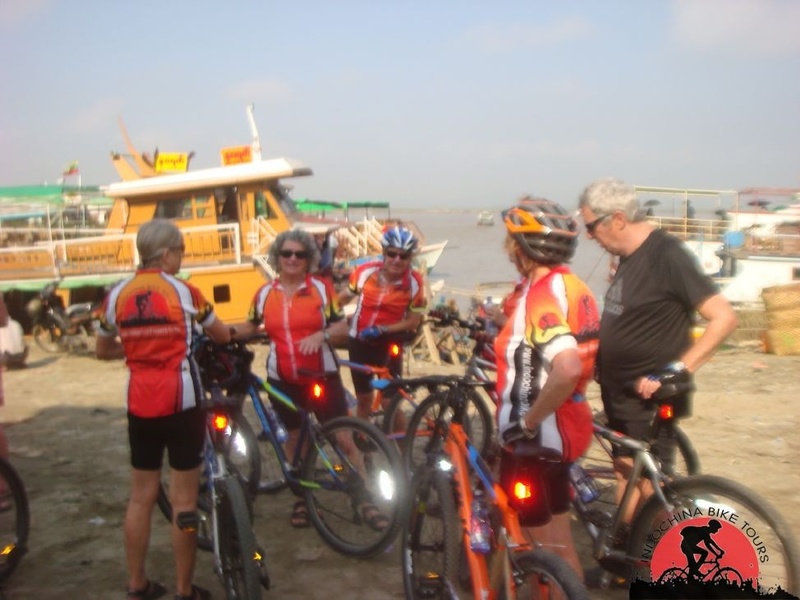 Then travel by back roads to the ocean, cycling through fishing villages and an ancient burial-ground of Hue (called a “ghost city” by the locals), to Hue city. Another option, keep biking on a little country roads to Hue city. 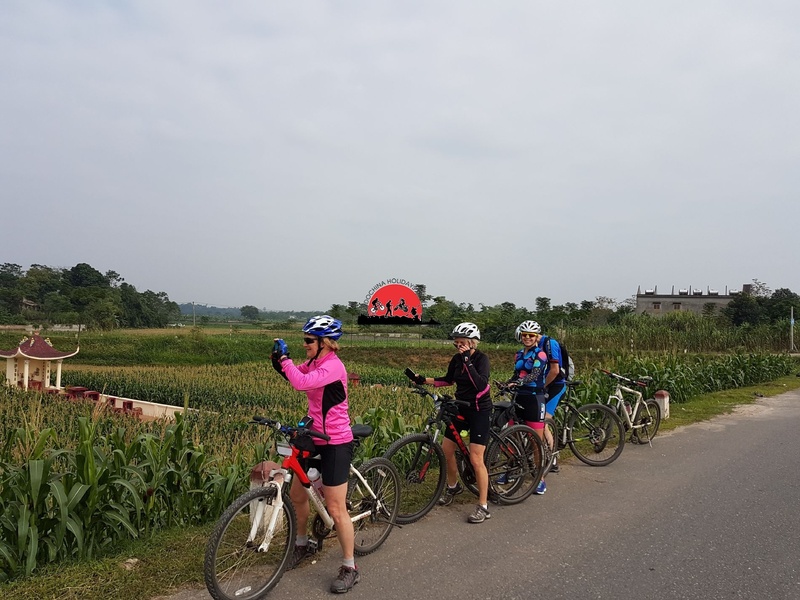 Ride to visit the forbidden city, the capital of Vietnam from the 17th to 20th centuries, continue riding on single track trails to visit the Thien Mu pagoda before transfer out of Hue to Dong Ha and the afternoon we will cycling on Ho Chi Minh Trails to Phong Nha National Park . Explore Phong Nha Cave in the early morning. Continue riding on the Ho Chi Minh Trail to Huong Khe . Ride nearly 70 km winding roads up the Truong Son mountain range to Phong Nha. From here, if time permitting–cycle gentle rolling hills to Huong Ke Town . In the morning, ride to Dong Loc, the T-junction, which has become unforgettable memorial history in the country during 1964-1972, when soldiers, young volunteers, cadres, and workers guaranteed safe transport to the battlefield. Many people from different localities laid down their lives. In particular, the death of 10 young volunteer girls at Dong Loc T-junction has come to symbolize the patriotism of the era. Now, Dong Loc T-junction relic has become a commemorative area for the national young volunteer force. In the afternoon, ride to Vinh City. Today, we have a chance to visit Uncle Ho’s house. Nam Dan district, Kiem Lien village is not only the homeland of Ho Chi Minh but also the hometown of many anti-colonist leaders. Ride on the new Ho Chi Minh highway to Kiem Lien village via Tan Ky and Do Luong. Visit Uncle Ho house in the afternoon, have a short drive to Thai Hoa Town. Overnight in Thai Hoa Hotel. An early morning start to beat the heat of the day. 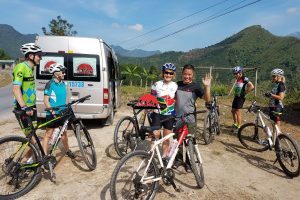 The route takes us away from the river and appears to contour through the same range of mountains that stretch from Thai Hoa to Cam Thuy on Ho Chi Minh trails . The road gets more beautiful the closer you ride to Ngoc Lac with looming karst limestone cliffs and lush vegetation. The route is tarmac all the way, but quite hard riding due to the undulating terrain. We ride for the first time on the newly built two lane Ho Chi Minh Highway. It hardly warrants two lanes as there is no traffic! The road makes for smooth fast riding, and for those who prefer there is always the old highway dirt and gravel – that weaves around the new highway allowing for plenty of exploring possibilities along the way. Ride to Muc Son, on the banks of River Song Chu. On the outskirts of this small town are the famous Kan Linh historical relics – a pagoda where the first king of the Ly dynasty, Le Thai To, ruled, in 1428. Continue riding on the trail to Yen Cat. The distance covered today is quite long and there will be the chance to transfer some sections by the back-up vehicle to rest weary legs.There are fewer villages today as the route cuts through forests and jungle lunch en route. Overnight in Cam Thuy hotel . 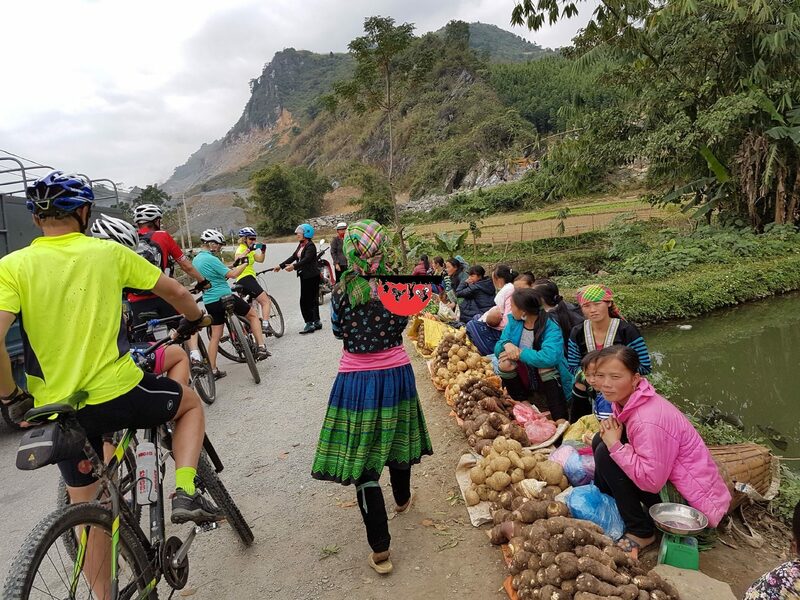 Breakfast at the local restaurant and cycling through village house before setting off along a spectacularly beautiful river valley towards Hoi Xuan along an undulating tarmac road. The road follows the flow of River Song Ma. This is an old supply route of the HCM Trail that fed the main trail with ammunitions during the American War with Vietnam.. just passing scenes of local village life and rice paddies. . Arrive Mai Chau villages and overnight in the home stay of white Thai ethnic. 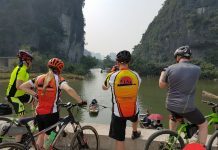 Pick up at your hotel at 7:30 and transfer by vehicle to Trung Ha and start cycling to Yen Bai on the banks of Red River . Arrive late afternoon. Stay 1 night. After breakfast. 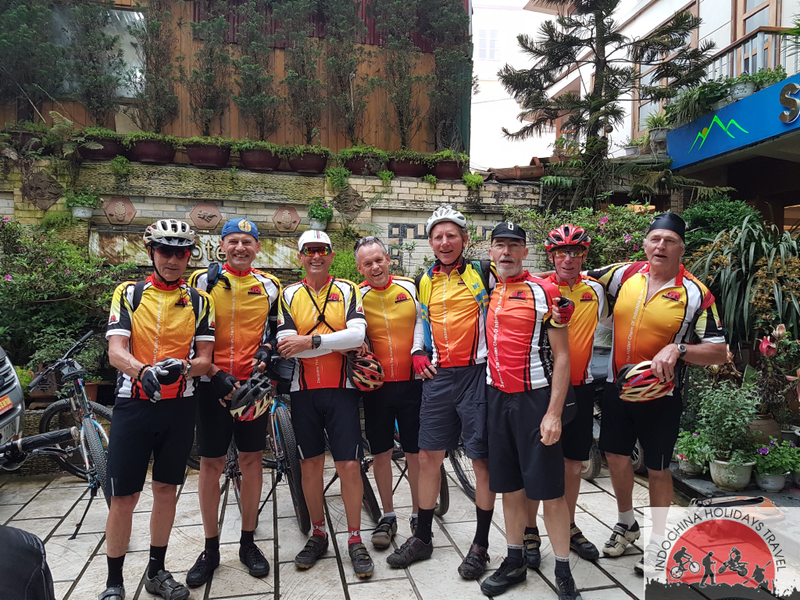 A demanding, hilly, day along the mountain and river range culminating with the ascent of the spectacular , visiting the Vietnam & China border gate if time permitting. Stay 2 nights. Start from your hotel at 8:30 Am , bikes to explore Sa Pa an old French hill-station, in a spectacular location close to the Chinese border. 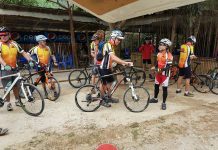 This morning we will cycling to Village , Lao Chai and Ta Van village ( Red Dzao and H’mong people ) . Cycling uphill back to Sapa ,lunch and dinner by your self. Retrace our route back over the Tram Ton pass to Binh Lu junction and follow the road 4D north west to Tam Duong and to Lai Chau . O / N in hotel . Ride: 80 km on good quality asphalt road, transfer 30 km. Our full day in Vietnam. 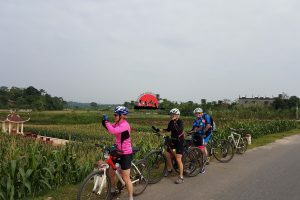 Cycle to Dien Bien Phu – 104 kms. Dien Bien Phu was the scene of the historic French defeat in 1954. Stay 1 night. O / N in Him Lam Hotel & resort . Ride: 90 km on good quality asphalt road, transfer 40 km. We depart Dien Bien and cross into Northeast Laos at Tay Trang and say good bye Vietnamese team . Laos team will pick up at the border .This is the least populated section of Laos. We continue on to Muang Khua on the banks of the Nam Ou river. Ride: 80 km on dirt road, transfer 80 km. Ride: 70 km on dirt road, transfer 40 km. Ride: 60 km on good quality asphalt road, transfer 40 km. On to the historic and enchanting city of Luang Prabang. We follow the banks of the Mekong before entering the city proper. 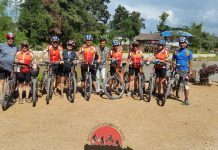 It’s also possible, with advance planning, to bike the 20k in the opposite direction to Nong Khiaw Transfer to Lunag Prabang. End The Tour. Ride: 40 km on good quality asphalt road, transfer 60 km. Accommodation: Luang Prabang Guest House .